My son’s car won the ‘Most Unique Design’ award in his age group and pack. 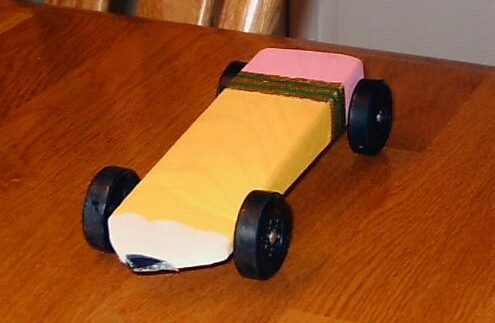 There were some other really great cars in the race, but no other writing instruments with wheels! This was a family project: Dad did the design and carving/sawing, son did the sanding and some painting, and Mom picked out the colors and painted. My son and I built this car in 1968. We designed it together, but he did most of the work. 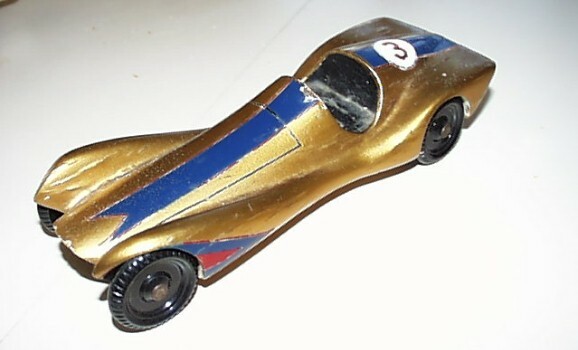 The official car kit was used with additional body work built up with 1/8 inch bass wood. The wood was cut to shape using a coping saw, and contour shaping done with my trusty Model 2 Dremel MotoTool and lots of sandpaper. The finish was clear model airplane dope with bronze powder added. Since official decals were not available in those days, I masked the trim and my son did the painting. After 35 years later, it still looks and runs fine. A good car is a true keepsake. The leaders of the Triton Cub Scouts change their Pinewood Derby theme each year to give the Cubs inspiration for a new car. We alternate between “Grand Prix”, “Emergency Vehicles”, “Un-Vehicles”, etc. The “Un-Vehicle” uses the same BSA kit, but the end product cannot look like a car – except for having four wheels. We’ve had eagles, sharks, “kiln dried” lumber, cell phones, bath tubs, pencils, candy bars, etc. It’s great fun to see the Cubs’ imagination at work. 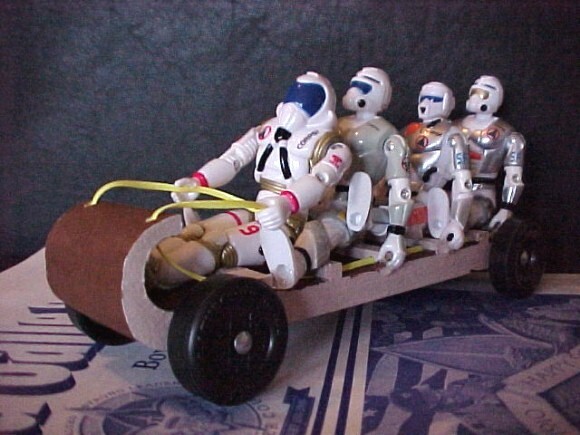 This ‘un-vehicle’ is my entry for the “Geritol Derby” (Leader, Parent, Sibling derby) which is run after the main event.